These stripes are essentially four fractures bounded on either side by ridges that appear to be composed of mint-green-colored ice. Known unofficially as “tiger stripes”, these surface fractures have become a source of interest for astronomers since they appear to be the youngest features in the region. Recently, between these stripes, over 100,000 ice blocks were observed, and they are a further source of wonder. Scientists with the Division of Geological and Planetary Sciences at the California Institute of Technology were able to map out the locations of these blocks in the hopes of determining just how they got there. Their findings, which are scheduled to appear in the January 2015 issue of Icarus (vol. 245), constitute the first quantitative estimates of ice-block number and density in Enceladus’ southern polar region in relation to major geological features. The preliminary results of their work reveal that ice blocks in the southern hemisphere are most concentrated within the geologically active South Polar Terrain (SPT) and chiefly concentrated within 20 km of the tiger-stripe fractures. They found further that the ice blocks are concentrated just as heavily between tiger-stripe fractures as on the directly adjacent margins. To ascertain just how these ice-blocks formed and evolved, and how they came to be distributed in the southern region, the team considered various mechanisms. These included the well-known aspects and features of the moon – namely its seismic activity, impacts by meteors, and volcanic eruptions – but also the possible roles of tectonic disruption of the icy surface mantle and ice slides. Ultimately, they concluded that impact cratering as well as slides, perhaps triggered by seismic events, could account for a majority of ice-block features within the inner SPT. However, they also noted that cryovolcanic activity – i.e., the ejection of icy material caused by sub-surface volcanic eruption, and the condensation of ice around the eruption vents – could not be ruled out. They noted that the pervasiveness of fracturing on many size scales, the sheer number of ice blocks in the inner SPT, and the occurrence of linear block arrangements that parallel crack networks along the flanks of tiger stripes, would seem to indicate that tectonic deformation also played an important role. Furthermore, they postulated that nearer to the warm tiger-stripe fractures, sublimation likely leads to erosion and disaggregation, which plays a role as well. Last, they noted that the relative scarcity of blocks beyond the bounds of the SPT, particularly on old, cratered terrains, may be attributed to ice grains accumulating on the surface over time rather than the same causal factors that led to the 100,000 blocks observed around in the southern region. 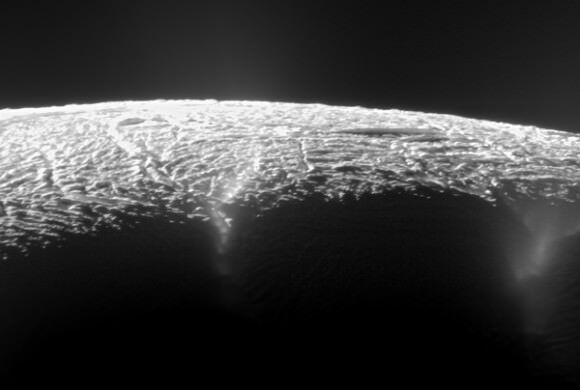 In short, the CIT team believes that the unusual ice-block formation around Enceladus’ south pole is chiefly the result of impacts from meteors or comets and seismic activity, but that the peculiar activity in this young region of the planet – such as volcanic eruptions from the hypothesized interior-ocean – may also play a role. The SPT ice-blocks were observed at very high resolution during Cassini’s July 14th flyby, when it observed the “blue ice” tiger stripe” around the south pole and noticed an area of extreme tectonic deformation. The blocks were manually identified and mapped from twenty of the highest resolution photos taken by Cassini’s Imaging Science Subsystem (ISS) and rendered using ArcGIS software. Recently, other researchers also mapped out the location of 101 geysers in this moon’s south polar region. Cassini continues to study Enceladus, and in fact the spacecraft conducted its latest flyby of Enceladus today at 15:23 (03:23 pm UTC) and its next scheduled flyby will be taking place on Dec. 19th, 2015, at 17:49 (05:49 pm UTC). This is pretty astounding. We’re mapping details like this on a world literally a BILLION miles (for the U.S., or 1.6 BILLION km, for the Earth) away! We’ve got some sick technology! As for these blue and green stripes in the ice on a planet with liquid water that comes out as geysers.. can you imagine the kind of funding we’d get if a probe showed they were organic? I’m thinking algae blooms here..
Next PostNext Just In Time for Halloween: Jupiter Gets a Giant Cyclops Eye!